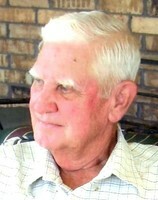 William Jay "Bill" Martin, Sr. Provide comfort for the family of William Jay "Bill" Martin, Sr. with a meaningful gesture of sympathy. William Jay Martin, Sr., fondly known as Bill to his family and friends, went to be with the Lord on Wednesday, February 6, 2019 at the age of 93. The son of Altha Lee (Harris) and Bryant William Martin, Bill was born on May 31, 1925 in Bokoshe, Oklahoma. After graduating from Spiro High School, he joined the United States Navy and honorably served his country during World War II. He later rejoined under the United States Air Force and served his country once more during the Korean Conflict. Bill married his one true love, Eva Christine Flanagan on August 14, 1952 and together shared nearly 60 years of marriage and raising their family until her passing on January 2, 2012. Bill enjoyed the fellowship of the Murrah Masonic Lodge in Spiro, Oklahoma where he was a 32nd Degree Mason. He was a true man’s man, who loved construction and working with his hands. Bill loved being surrounded by family whether it was in the city or spending time at the lake house in Eufaula. He will be missed by all who knew and loved him. Sisters: Naomi Foote and Evelyn Stonesypher. Numerous other loving family and friends. To send flowers in memory of William Jay "Bill" Martin, Sr., please visit our Heartfelt Sympathies Store. We encourage you to share your most beloved memories of William Jay "Bill" Martin, Sr. here, so that the family and other loved ones can always see it. You can upload cherished photographs, or share your favorite stories, and can even comment on those shared by others. Provide comfort for the family of William Jay "Bill" Martin, Sr. by sending flowers. Offering my deepest condolences at this time. May you find comfort in knowing that your dear loved one is resting now...merely sleeping and that soon Rev. 21:1-4 and Psalms 37:29 will be a reality....that soon we'll be able to see our loved ones again in a paradise no longer plagued with death, tears or pain. "The former things will have passed away." I am so sorry for the family’s loss. Death is one of the hardest trials to cope with. May you find comfort from the future promise recorded in Revelation 21:4 which says “he [God] will wipe out every tear from their eyes and death will be no more.” We can be certain God will fulfill the words from his word the Bible.